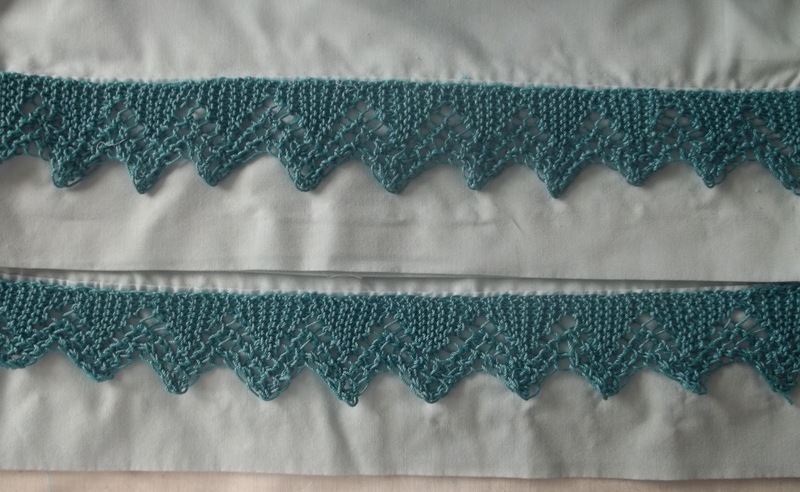 Back in May, when I started my sewing spree, I spent some time in the evening knitting up a semi secret project—namely, yards and yards of knit cotton edging.. I finished sometime in June. Now finally, I am sewing the edging onto pillow cases and sheeting. One set of bed linens (or should I say cottons?) ended up with lace edging on the hem of the top sheet, as well as on the hems of the pillow cases. The other set, just has lace trim on the pillowcases. I love this kind of luxury touch--my DD thinks it is a total waste of time! She claims no one under the age of 60 would be interested. She might well be right. I also made up 4 sets of “bonus” pillowcases—these will be embroidered—I like these nice little touches (well not the past few days when I have been engaged in attaching the lace to the hems!) even if they are out of style. Attaching the lace to the sheeting is slow and boring. Not helped by being a bit sick. Last week, Wednesday, Thursday, and Friday I helped out my DD—One, then other, twin came down with a cold like virus. Both girls had mild fevers, were cranky, (headachy) and had upset stomachs--(which generated lots of laundry.) I provided some relief—mostly simple babysitting while my DD got laundry and other projects done. I ended up exhausted—the NY area had a mild heat wave—with 90° temps, (not horrible, since at least 2 days had somewhat lower humidity) but it never cooled down—76° or warmer at night. So I didn't sleep well, and missed my afternoon naps. I tried to recover on Saturday—but by Sunday, it was clear to me, I had caught what ever it was the girls had. I was so sick Sunday to Monday night—high fever, headaches, and muscle cramps...So sever, that I was uncomfortable all day Monday. I felt like I overdid it.. tender arms, and tender abdominals, too. I missed being sick to my stomach—but only because I hardly ate anything. I could complain more and provide more (TMI) —but I won't. I am over the worst of it –sleeping away most of Monday helped. Feeling a bit better today, I am continuing to do bits and pieces of sewing too—all sort of hand stuff—replacing buttons, and stuff. I have all sorts of chores to do—laundry, shopping and the like..The laundry is all sorted and ready to go, the shopping lists (yes, plural) are ready to go too. Now I just need to get going! Along the lines of “the best laid plans of mice and men” Life interfered—I didn't post this yesterday, and I didn't have an hour to finish it..and I won't have the time today either... So it will be finished, and the mending done, when life settles down. This is the last project—a quick little mu-mu dress. Not a tent like mu-mu, just a bit loose and simple. It is not really finished—I want to add a bit of elastic at the back and two ties (to tie in front) but that will take less than hour. I already have the ties made, and the casing ready to go.. It's a pretty little thing to wear to the pool—the front has a zipper making it easy to step into, or out of. It has, of course 2 side seam pockets. The basis for this little dress is the top I made in the beginning of July, which was also in blue—but a totally different print. With an added ruffled tier to lengthen it and some other small changes. I also made a wider bias band for the neckline--(and I like it better than the narrow one!) But all in all simple, almost shapeless.. Easy to sew, easy to wear. It will be a “better” house dress after the summer—good for wearing around the house, and even good enough to wear when doing laundry-- It is loose enough to admit a T-shirt underneath—so come the cold days of winter, with a long sleeved T worn under it, will make it suitable to wear then, too. Nothing very special, cheap as they come (under $10 for the whole thing—including the zipper and elastic) but pretty enough. While I should be putting my sewing machine away—I won't—Not quite yet. I still have 2 or 3 things that need a spot of mending... and I intend to get them done. But no big projects.. just a seam that has a broken thread repaired, and the like. If I just spend an hour a day, I will have all the final mending projects done in a week. I have already done a whole lot of mending.. and cleaning up (2 “waste can” sized bags of scraps, and threads and wrappers from zippers, and card stock from buttons) –but there is more to do—Not sewing, but stuff to do in the sewing room—including some organizing. The last Saturday of sewing—for a while, at least. The grey skirt is finished. 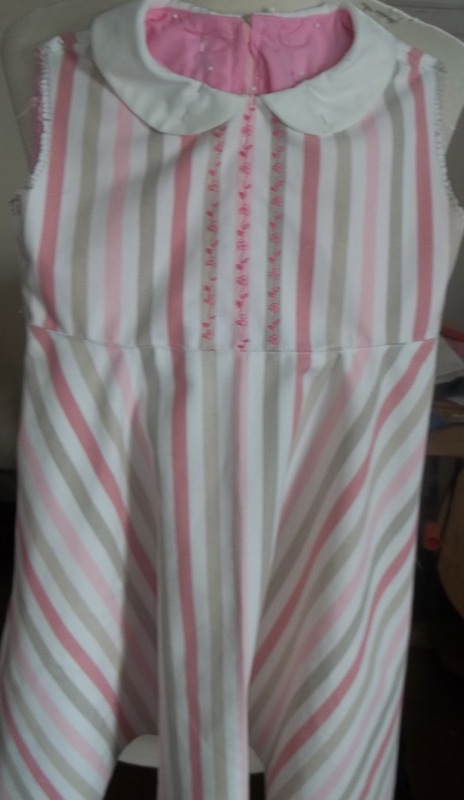 I made a quick little summer dress too. It's not completely finished, but it will before the end of the month(Monday) That's enough for now. I have been busy sewing since May –3 months of making clothes! Some matching sets, and some coordinating sets, and some simple additions. 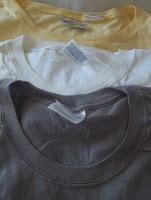 A trio of Tee's to match. I have culled clothes that were old, worn, stained and really other wise unfit. My closet is neater, (and prettier) I still have plans for new hangers. Before I moved into this apartment, I painted. The living room and dining room and entry were all professionally painted. At the same time, I bought some very cheap paints—Top quality paints that had been custom colored, and then returned to the store—to paint the closets. The color choices were close (but not perfect) matches—but the inside of the closets went from dry, cracked, dull and dirty white, to pretty. My purple foyer has a huge walk in closet—Painted a periwinkle blue (more of the same was used in my bedroom closet) really changed it form drab to cheerful. Periwinkle is quite purple, it was a almost a pastel shade, and besides, the inside of a closet doesn't really have to match the room. The walk in Linen/utility closet in the Sunny yellow computer room end up with a marigold yellow interior--(and toffee brown shelves.) I only had a quart of the yellow—and another quart of the toffee brown. All the closets got spiffed up (patched and spackled) and with a new coat of paint, (and a week to dry). While I was at it, I polished all the closet poles with butchers wax—designed for hard wood floors. So when I moved in—I had cheerful pretty closets with slick, smooth poles, to hang my clothes in. The finishing touch was, I bought a whole lot of hangers—all matching. OK, so the entry closet(coat and raincoats) got a mix matched set of left overs, but my clothes closets look nice and neat with all matching hangers. Now, some 17 years later, those plastic hangers are breaking. The heads snap off, the lower bar snaps—sometimes in two, (and can be temporally saved with some duct tape,) sometimes in 3—and the hanger is a goner. The same too with the skirt clips. many of those have broken, too. My plan now is to head to Bed, Bath, and Beyond and to buy a box of 50 new hangers, and a few packs of skirt clip. and to once again have a neat looking organized closet. Everything will come out, the pole with get a new coat of wax and will be smooth again. The clothes I want, will be hung up, the clothes I have been on the fence about will be altered, (or chucked) and order will be totally restored! The Jumper will be a bright yellow denim—I don't intend to wear the vest with the jumper—it's just an extra one. I needed 3 yards for the jumper, and the bolt had 3.5 yards—A half yard isn't enough to make a vest (normally) but I have made this jumper before and know that I will have a lot of fabric left over. I need the LENGTH—no matter the width—and this denim is 60 inches wide, so I will have a good bit of left over fabric—the sides and even the back will be cut from this “waste”--So the vest will mostly be a bonus--especially since the extra half yard was discounted. . I love vests, and an extra one in a solid color will go with lots of things. The final bit will be organizing the remaining fabrics and pairing them with patterns. I sort of plan to start sewing some more things come September—but there are quite a few other things already planned for the first 2 weeks in September, so I won't start in right away. I also want to invest in some better organization of my sewing stuff. I am determined to buy some spool racks and to put up some shelves and other organizing bits. Lots of plans.. Now I just have to implement them! Meanwhile I took a break and got some mending done... took up the sleeves of a jacket for my DD, and some other mending—lots of little things done. I also made 4 pairs of pillow cases, too—A bit fancy with french seams, next they will embroidered. I like to sleep with NO air conditioning. So cotton sheets and pillow cases are a must. Extra pillow cases are useful, too since I sometimes change them more often than sheets. 2 pairs of natural white cotton, 1 pair each of blue and pure white. 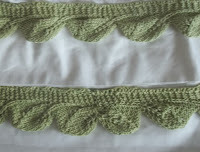 I also got some hand knit lace trim added 2 pairs of pillow cases. Very simple projects.. but nice to have them done. More about these (and photos) later this week. This foot has been advertised all over Face Book—and yes, it does work. I can't see it working for a full quilt; the whole piece of fabric must be rotated. Fine for a square, (that was later pieced into a quilt) or for decorating some fabric for a bodice or even a hem of a skirt. The circular flower like embroider on the hem of child’s dress, or on the lapel of casual jacket. Well lots of places. Note that is a quarter--the circles even at their largest are still pretty small. It take some practice to get a nice result. This scrap that I practiced on shows some potential. But—to get a really professional result, takes some practice and fine adjustments. 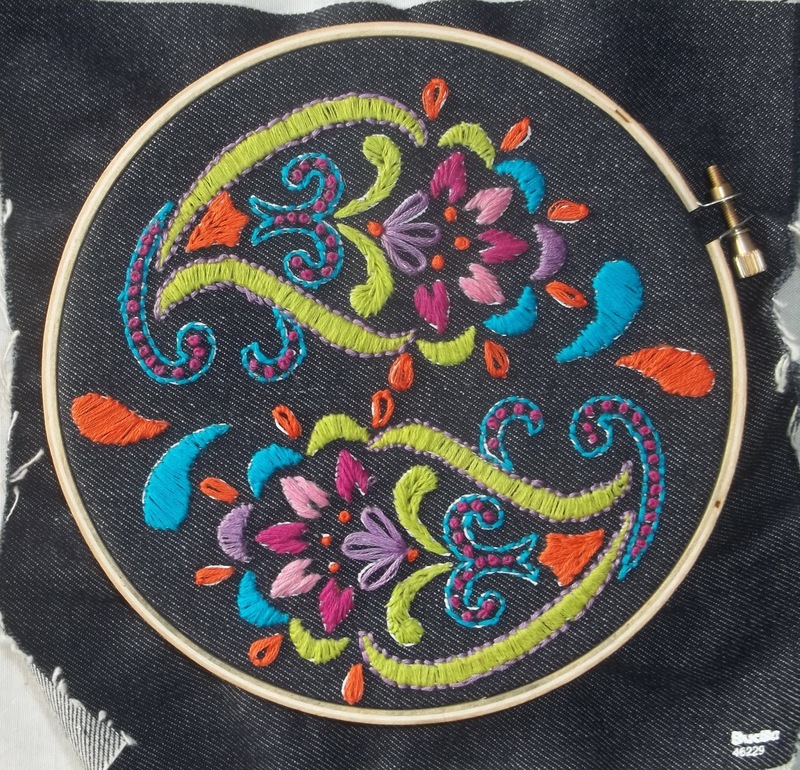 First: There is a need to change/adjust: pressure foot tension (increase), thread tension (decrease), stitch length, (shorter), stitch width, (wider, sometimes) needle position, (to the left--for the largest circles) Getting the adjustments just right will require some fine tuning. 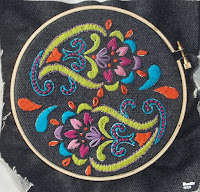 3rd There are adjustment to the foot, too—to make larger and smaller circles.. and some skill to starting and ending neatly—I can see how better (embroidery) thread will help too. I can see myself using this for flower like decorations for my granddaughters dresses—in time.. my first efforts aren't bad—but I expect I will do better as I get more practiced. Now I have an Instant Pot—that serves as a rice/grain cooker, slower cooker, and pressure cooker, steamer, and more. I won't use it much in the heat of the NYC summer.. but come the fall, I am looking forward for soups and stews and other hearty meals Maybe even some old fashioned Boston brown bread—Does anyone remember that? I think its time for a revival. The Instant Pot is also a steamer, and Brown Bread is steamed. 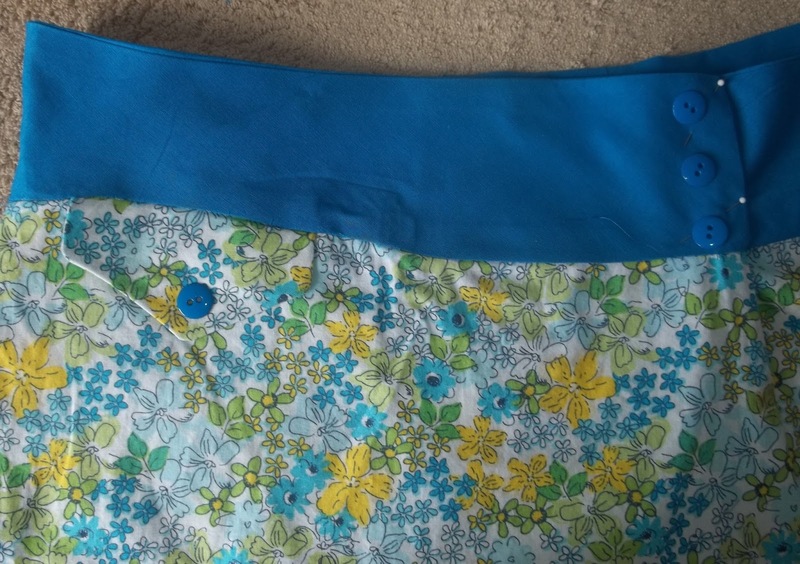 No, not a typo—A couple of things came together—1) I found grommets that I liked, 2)—I reviewed the instructions for my Crop-O-Dile grommet tool, 3)—I finished the blue top by added 10 eyelet grommets on the center front-- I have found it such a hard time to find eyelet grommets (they are sold (allegedly!) in both the fabric/craft section and the scrap booking section (the Crop-O-Dile tool is sold as a scrap booking tool) –but finding them? Forgetaboutit! I don't know if they are so popular they are hard to keep in stock, or so unpopular, they just forget to re-order when they are sold out. So, when I did finally find some, I bought a few packs!. I have meaning to add some eyelets to a pair of sneakers, (will do!) and to a few other things (I often make small “gift bags” out of scrap cloth—they can be used and recycled (as gift bags to wrap gifts for others, or for little storage pouches—which are great for travel). Eyelets, vs button holes, or even finished edges in seam allowances are the easiest way to add drawstrings. I like the skirt—but I am not sure I am sold on the front ruffle—Time will tell. It is a pretty outfit, and the pieces are good separates--I will be able to wear each piece with other things I already own. I also found some pale, pearly green buttons—This was all on my shopping trip to buy interfacing (3 yds. each of lightweight and medium weight, plus some tear away for machine embroidery.) 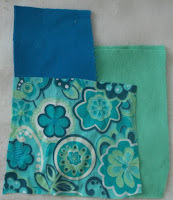 I never buy less than 3 yards of interfacing at a time—to me it is a sewing staple. I last bought interfacing about 3 years ago—so it was time. I am thinking of doing some machine cut away embroider (which is why I bought tear away interfacing). I am also thinking of adding some more of the shiny embroidery thread to my stores. It's not cheap. ($6 a spool) but the spools are huge. and the finished effect is very nice. I have a few store bought tops with some cut away embroidery—and I really like the look. Well--it can wait, it will still be there next time I go to the store. But before I start experimenting, I have a queue of sewing to do: 1) sewing up the grey and yellow skirt and vest set, already cut (except for interfacing! ), 2) A Jumper dress, (or 2! ), One in a color (looks like it might be a yellow, (but dusty pink might win out over the yellow)); the other, a denim) 3) another shirt dress (in black, trimmed with red). And then, I'll take a rest, I promise! This should take me till the end of July, I will take August off, and start up again in September with some more skirts and vest, (and more old clothes discarded!) And by then, I'll have developed a queue for things I want to knit! Even with the added work of gathering and binding, this top came together in a snap! 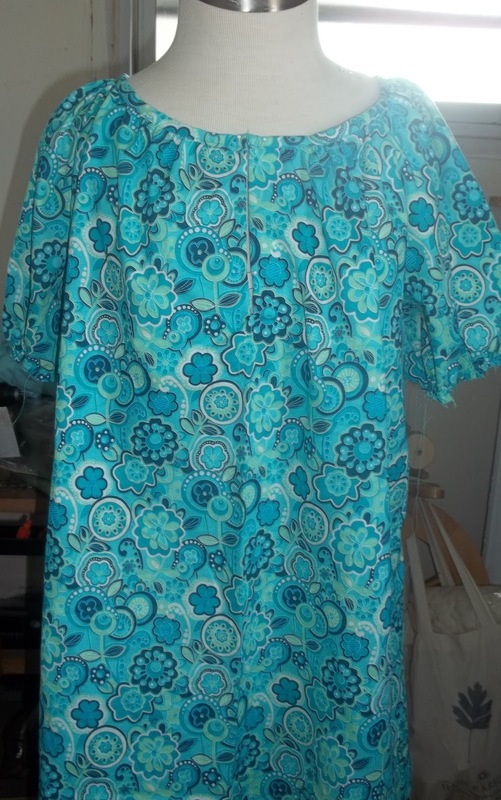 The last time I made this style top, I made a hem facing and used narrow elastic to gather the neck line, (and sleeves), but even with the added work of gathering and binding was quick to make!. OK, so I still need to bind the arms, and add some grommets to the front for the lace up detail, but mostly done, already! I don't think I spend much more than a hour working on it..
First, I lowered the neck—It is not low now, but it was way to high for a summer top! Secondly, the pattern featured long sleeves—again, not a great choice for summer top. So I made them shorter, and fuller-and gathered. The long sleeve version was gathered at the cuff—but most of the fullness was at the cuff, not in the upper arm area. 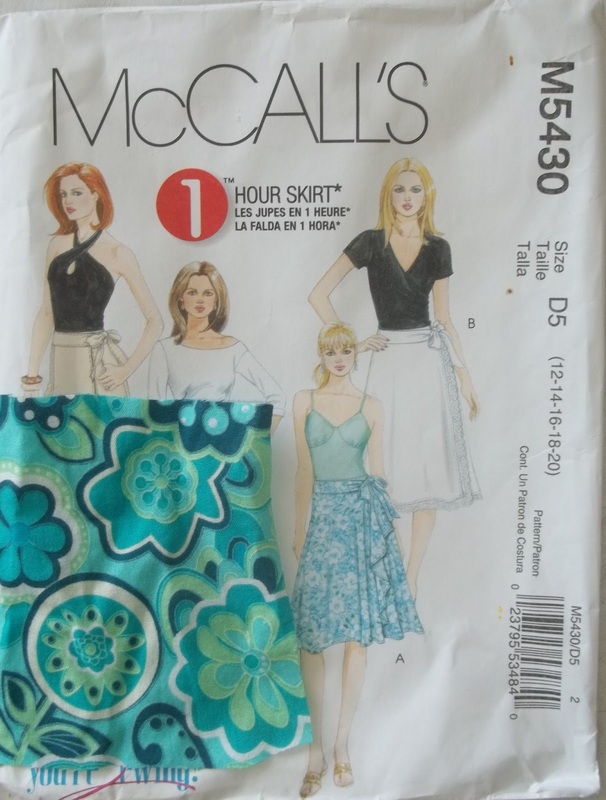 The wrap skirt is labeled “1 Hour Skirt” but I planned on lining the front with a solid turquoise blue, I don't like the wrong side showing in the ruffle. I will put the pattern together in my own particular way (and eliminate hand stitching the curved waist band) The result will be a very neatly finished inside. It won't take too long to make, but it will take more than an hour. I might get some work done today, and tomorrow—but one day will be partially used to go and buy some buttons and some interfacing. Of course, Saturday is for sewing—so that will be the day to finish up—and get started on the white/grey/yellow vest and grey skirt! No sewing on Saturday, no sewing on Sunday. No sewing Monday either, but I have been pinning and cutting galore. The peasant top was cut last week. Monday, a matching skirt. In addition, I cut a grey skirt, with a matching print vest, (yellow/white/grey), and finally, another skirt. 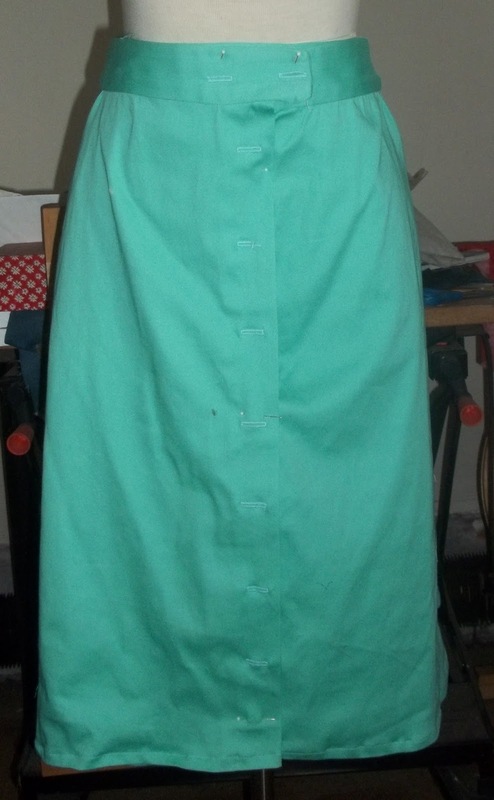 The last one in the nile green twill--so 3 skirts, one top, and one vest cut—I even got all the interfacing cut, too. The green skirt matches the print top—making a mix and match pair. It also matches a print T-shirt top that I have—and will go with many solid colored T's, too. The grey skirt is the same pattern as the navy blue skirt, and the medium blue skirt (this same skirt has been made in a black poly twill, and chocolate brown, and several prints, as well) Do you get the idea that I really like this skirt? —The grey skirt isn't the last time i will use this pattern. There will be several more skirts in this same pattern. Remember how I said I almost like uniforms? This skirt is one I make again and again. A basic piece of my uniform. that is what I used for the basic vest, and the alterations to the pattern. I like the kind that has a shiny coating--(looks like a lightweight plastic) What ever the coating is, it irons on to the pattern tissue paper like a champ! Too bad its not the most common packing paper. The fold and tear brown craft paper is more common—and I use that too! No dresses, or jumpers pinned or cut—but there is a good chance that there will be at least one pinned and cut before the end of the week. The plan, now is to sew up as storm! First the print top, then the print skirt, followed by the nile green skirt ( don't have buttons to match this yet, so it might be postponed) Finally, the grey skirt and matching vest. The print top and skirt is sort of planned as a pool outfit—easy on and easy off. City pools open this weekend-I need to be ready! This vest pattern fit nicely in neck and bust--but was to short (to my taste) and too plain. I have altered it to make it longer, (4 inches longer!) and made it with both a V neck as well as the round neck shown, and also changed the hem to add shaping (points). And of course, I have added pockets! I've made over a half dozen different (but the same) vests from this pattern.. with many more to come! I love the way a vest finishes an outfit. I knit vests, too, for the same reason. This pattern has 4 views--a 4 gore swing skirt, an 6 gore A-line and an 8 gore skirt with shaping--beyond A line. The 6 gore version is the pattern used for the newest grey, last months navy, and April's medium blue set of skirt and vest. I have been making this skirt for 4 + years and I haven't tired of it. I plan to use this pattern at the end of the summer, again, when I make up some more skirts in darker (wintery colors..) Easy to make, great fit, and classic style! I like the idea of wrap skirts--but I don't always like to wear them.. they blow open, and well... I keep trying, hoping the next one will be better. I am sort of making view A, with the ruffled front--but not the tie. To me, the tie is just too much--looks like an outfit for a child! I have previously made the simpler (no ruffle version) of this skirt--a few years ago, with the same purpose in mind--a quick wrap skirt on my way to or from the pool. The nile green skirt is a basic A-Line, with a button front. The pattern is ancient--I no longer have the envelop! Party dress 1 (pink) is done—well, maybe done. I still might add a ribbon sash. Party dress 2 (blue) Joined it today. Done but for the possible addition of a ribbon sash, and a bit of hand sewing finishing detail. The party isn't till June 17th—so I have time to continue my search of the right ribbon—and to make up a sash for the dresses. Before I had started the dresses, I did a bit of clean up—and found a project from last year—75% done that was just sitting there... Why had I stopped working on it? I don't know! My guess is, is that it I needed buttons (3) and a spool of thread, and the local A.C. Moore had closed (there still is a Micheal’s—but it is slightly less convenient) But who knows? Not me. I have a car now (and didn't then) so I have more options about where to buy buttons and ribbons (for bows) and other stuff.. So, with the party dresses are finished, (and while I am looking for some ribbon for the sash), I will get a spool of dark navy thread, and some buttons—and will finish up! 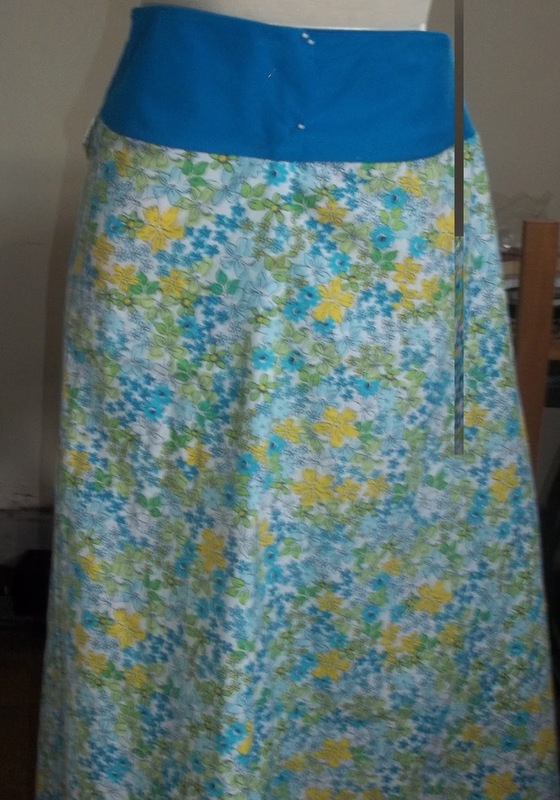 The project is skirt, a simple 6 gore A line(the same as the medium blue skirt and vest I finished a few weeks ago) and a very short sleeved cropped jacket. The skirt needs the waist band and button, and a hem. The jacket needs 3 (or more) buttons (and buttonholes) and the hem—So close to complete! It won't take much time at all to finish! Very often, I plan my sewing to a need for my own party dresses. The Yellow/white/blue dress made its debut on mothers day (and, truthfully hasn't been worn since), the skirt of the same fabric debut at a day out with my DD, & grandchildren—a low key outing, but.... The grey dress with all of the top stitching and details? It will be my party dress on the 17th—A 1 year old birthday party, in basement party room is hardly a super special occasion, but then, the dress isn't really super special either. It is nice and detailed, but not at all fancy. Mostly it is NEW and new is always special in its own way. This blue skirt and jacket? I don't remember if it was planned for a special occasion or not. But when finished will likely go into the wear immediately pile. The jacket has just a cap sleeve, and is loose fitting—so in spite of its dark color (It is a close to black navy blue) I will be wearing it this summer. 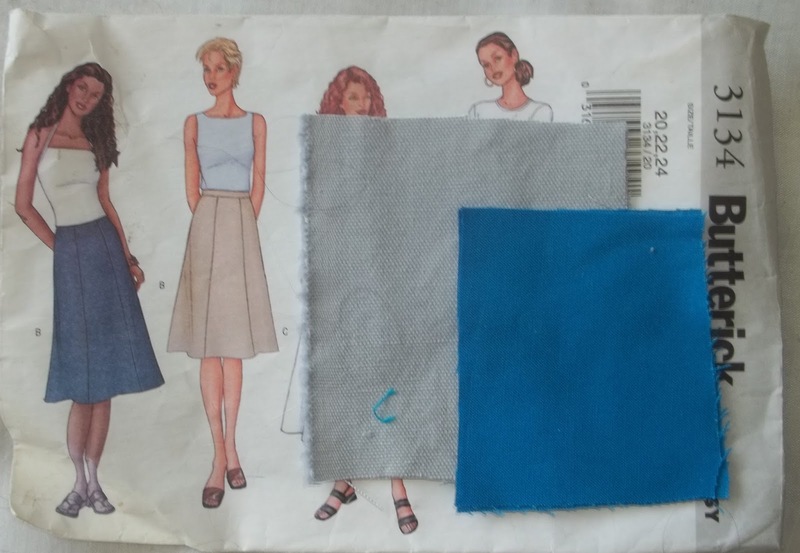 It will be a cross seasonal outfit—and cross matching--The medium blue vest will look nice with the dark navy skirt—and the cropped jacket will also pair up well with the lighter blue skirt. It will be fine to wear in the summer, and fall, and maybe paired with legging, the medium weight cotton will see some winter wear. Come next spring, it will one again be an every day outfit. I even have a dark navy cardigan sweater/jacket that will be a good go with.. I haven't spoken about the outfits that have been culled—and there have been many in the past few months!) Some clothing I purchased back in the year 2000—a set I LOVED. There was a local (I have moved since, so it would not be local now) K-mart closing—and I bought, on the store clearance sale, a set of 2 skirts (identical!) a camp shirt, a tee shirt and vest –all coordinating—I wore the pieces to death! I hated throwing them out.. but every where, the seams were coming apart—the side seams (and pocket seams and the hem, too) on the skirts, the collar and front button band on the camp shirt, the patchwork design seams on the vest...Every where, every pieces were thread bare. They were falling apart, and beyond repair. I also have 2 jumpers from the same clearance sale—that are close to being tossed—I have twice repaired the jumpers (One was a bit too big, and it got taken in and made smaller to salvage) and any day now, they will fail—and find them selves on the dust heap. There are 2 other out fits, (even older!) that went from special occasion, to work outfits, to every day, and now about to be dumped— One skirt, shirt and vest outfit came with a matching cardigan, which has seen less wear—It will go well with the navy skirt – The cropped, super short sleeved jacket is fine for summer, but the cardigan will be better for the spring and fall. So the new additions I have been making are not going into an overstuffed closet, but into one that has been suffering loses. And, today it is DONE! Top stitched, hemmed, and all buttoned up! The same as half dozen other versions I have already made, and yet so different! I still think it needs a bit more—Not ribbons perhaps—but I could make myself a General—I do have silver start buttons—to add perhaps to the collar or on the epaulets? Or maybe not. I am not a member (nor have I ever been) a member of the Services—It bordering on wrong to make it look too much like a uniform. Besides it not really my style to overdo. I'll leave it be for now—I can always add more trim. Not sure if I am ready to start the dresses for the Girls—I have been sewing and sewing and its time to sweep the floor with a magnet (and pick up all the pins) and to vacuum up all the thread, and fold up all the pattern pieces and put them away (before I pull out a new pattern). The new pattern needs to be copied (since it is sized 4 (desired) to 8) and planned. I plan to line the bodice of the dress (not a feature included in the pattern)—and use the same lining fabric to make a pair of over pants—Times have changed—I remember the song “I see London, I see France, I see (someones) underpants” which often happened with rough and tumble playing—I wore slips under my dresses, (even when I was a pre-schooler!) but hanging from monkey bars, or other play often reveled my underpants—and that was acceptable (or not and I was sometimes admonished to not play that way but to be more ladylike) I don't want my granddaughters to feel they have to be ladylike—before they are ladies. I want them to be able to dress up and still be able to play as they chose. My granddaughters (and most girls today) wear undershorts, or something under a dress (if they wear a dress!) to modestly cover their under pants. A small pair of shorts, with easy on and off Velcro closures are a required added accessory to the dresses. They will match the bodice lining, and make the outfits. Childrens size 4 dress will be faster to sew—and since both will be sewn with the same thread (more grey!) making them in tandem will still be faster than this last shirt dress. I used 2 full spools of thread, and 5 bobbins! Top Stitching really eats up thread! Saturday, I woke early, and did a little work on the Grey dress before breakfast. After breakfast, I was exhausted. I had a headache and low fever. So, back to bed, for a little nap. After the nap, I put way some of the clothes, ( I did 4 loads of wash Thursday)—and didn't get it all put away—partly because 1 load was winter clothes—and these didn't put back—put packed away, and secondly, a few pieces needed a bit of touch up ironing. I didn't get the touch up ironing done in the morning. I did next to nothing, really, at all, but I was still felt tired, and fevered. It was a beautiful, warm (but not hot) day, but after all the effort involved in putting away laundry, I ended up taking another nap. 3 hours later, I woke, did a bit of ironing—from the laundry, and the dress, too. So now, the facing and collar are done. But not the top stitching, nor the buttonholes, or hem and buttons. It is still not finished. And absolutely nothing started on the dresses for the girls. But what ever had me under the weather all day finally passed by 9PM. I hadn't eaten anything since breakfast—but now was hungry—a salad and small serving of pasta was more than enough, and the day was over. It is not much of a day when all you ended up doing is putting away some clean laundry, and your biggest accomplishments are naps. But tomorrow is another day—and the end is in sight for the dress. Woke this AM feeling refreshed—My goal is to get the rest of the dress done—early. The buttons for this dress are the hammer on rivet like kind—I need to get them done during daylight hours—or wait till tomorrow. A half a dozen seams later, and a pile of pieces become a dress! Well almost a dress. The dress fronts sewn to the yoke, and the dress back, too. Then the side seams, with the narrow back belt in the seam, and a very dress like form begins to emerge. Followed by 2 set in sleeves. It is very clearly a dress! There are still the front facing, and the collar and all those final details (buttons and buttonholes and more) but the end is in sight. It looks a little plain—Maybe some silver fringe for the epaulets? Just joking! Thought I did consider some ribbons—thing is these days ribbons are only sold on small (2 yard or so) spool, and finding interesting striped ones? Plus there is the this--buying several spools for just an inch or two of trim? I think the silver buttons will enliven the look enough. I don't want to go overboard on the military/uniform look. But it does look very different than the other dresses I have made with this pattern. 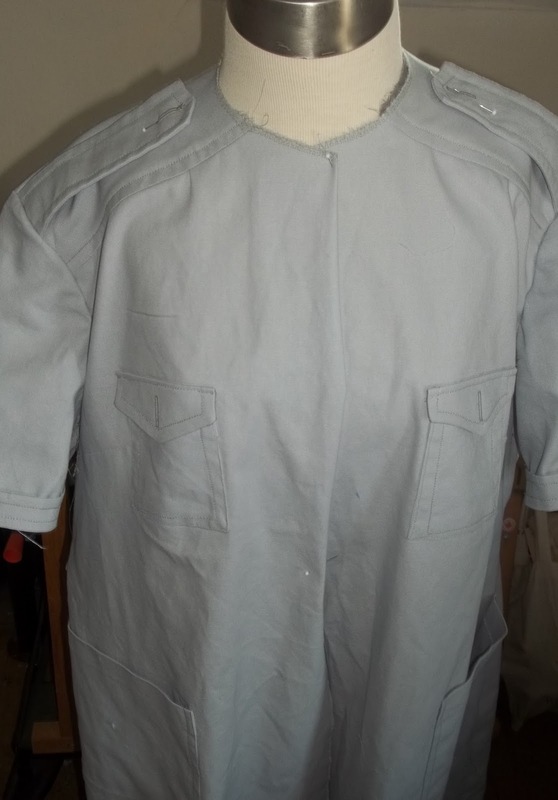 (see my post of 4/22 for 3 different looks) None of these details (pockets, flaps, epaulets, top stitching (or even the shoulder yoke)) were part of the original pattern—which was very plain. This is the sixth version I have made of this shirt dress—and I haven't come close to exhausting the variations I could make. It is part of my personal uniform--that most don't recognize as a uniform at all. And so it goes: a little bit of creativity, a little bit of practicality, a little bit of luxury(I'll show the lining details tomorrow) —all in one. Today is my day with the girls (grandchildren) –so I won't get any more of the dress done today—but tomorrow is Saturday—and Saturday is for Sewing. (We'll just ignore all the hours I have work on it this week!) I'll finish up the machine sewing, and then work the hand details, and have a new dress done in a week and day. If I do so early enough, will pull out some striped fabric for dresses for the girls—and get the pieces cut—and start all over again with a new project. I still have more blue linen like fabric—Not a lot, but enough to make half a skirt—another yoked skirt, with the solid blue as a yoke, (a larger yoke than this one) –and a different print for the other half of the skirt (there are only small scrapes of the yellow/blue/white print)—The third skirt will also go with the vest—giving me 3 options--(actually, more because the blue vest will go with lots of other skirts, and at least one other shirt dress) – to mix and match. Coordinating separates can really expand a wardrobe. I don't remember what I had planned to make when I bought the blue fabric(about 5 years ago! )—I do remember is was a bargain bin choice, and I bought all that was left from the bolt (about 5 yards of 48 inch wide fabric) –thinking that this was enough fabric to create a number of options—and so it goes, one solid (and somewhat formal skirt,) a print skirt with blue trim, and finally a sort of color block skirt, with a deep yoke of blue, and (likely) a flared lower tier—I have several prints that might be go with. 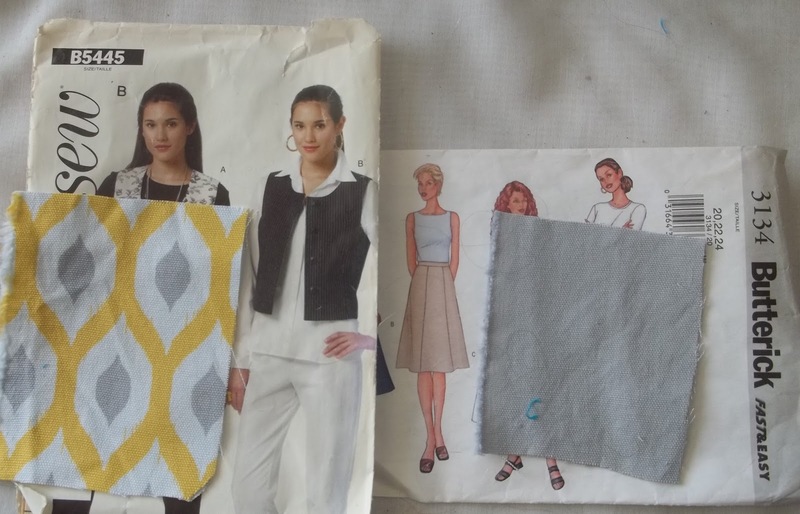 I have been sewing almost half a century, and I know how to sew—I tend to start with commercial patterns, and then just “adjust” and add detail... In this case, the yoke is an added detail and so is the little pocket added at the lower edge of the yoke. (Which gave me no end of grief to get right!) I will make buttonholes, and add the button—and there will be 3 buttons on the yoke for the closure. I love that I was able to find buttons that are a perfect match! The little flapped pocket is #3--this skirt also has 2 side seam (full sized!) pockets. It is more or less my own design (thought there is nothing especial original about the design) Just a few details to make it slightly different than the other half dozen skirts I have made from this pattern. The outside of the yoke is finished, not so the inside, and there are buttonholes and buttons, and the hem—a few more hours of work left to do. But it has taken shape—and you can see how it will look—since there is work to do, but no major changes from here. I need two new things now—a blue hat, and blue sneakers. I do have two lace hats (my knit lace ones) the blue is a close (but not perfect) match and the yellow is almost a perfect match. I have a white and yellow baseball caps, too, —but no blue sneakers (or for that matter, yellow sneakers). Most of my sneakers—old fashioned lace up ones, or casual canvas slip on's are (currently) black, grey and white--There is the a single blue pair (turquoise blue) another pair that are red—and one a paisley print. In 2015, I finally tossed a pair of custom dyed sneakers I bought to wear to my sons wedding—almost 20 years ago! At the same time, I added embroidery to a pair of white sneakers—I only wore them a few times last year (they are as good as new) These are pretty, but they aren't the best match for the yellow/blue/white print—I'll look for another pair of white sneakers—and use fabric paint and a little bit of embroidery to make a pair to match. So the vest is nearing completion—It still needs buttonholes and buttons. My machine makes them automatically (don't you just love a feature like that?) All I have to do check/correct the size before I start. The matching skirt? The raw edges have been zigzagged to finish, and the pieces joined together (the Barrel is done!) Next the top and bottom edges—first the waistband, then the hem, and finally the hook and eye for the waist band. It won't get done today, and will likely be done in 2 separate mini sessions. My dress form, (a recycled one) is a small (6) sized Junior one—so the skirt and vest are pinned back to look smaller. But it is still a nice looking set already. You can see progress has been made. Then, a pause for clean up—stacking up the bits and pieces of fabric that will become Iron on appliques for T shirts, and making some Bias tape to form into flowers (to make pin-on flowers to decorate baseball type hats, or even to pin onto sneakers) Not too many—anything too matchy-matchy is not the look I am going for! But sometimes a small touch is nice. After that? Well the skirt length cuts have been washed and pre-shrunk—But before I worked on the solid colored skirts, there is the print skirt with the solid blue yoke/yelow/blue/shite print, to be done.. And there maybe another shirt dress or two—in solic colors for a change. The mental queue goes on then the pretty multicolored vest—And somewhere, soon in the next few weeks, 2 small dresses for the granddaughter—before I get started with the solid skirts... The pink will likely be the first one—It will be full summer by then—the other colors are season spanning.. but bubble gum pink is most definitely a summery color! 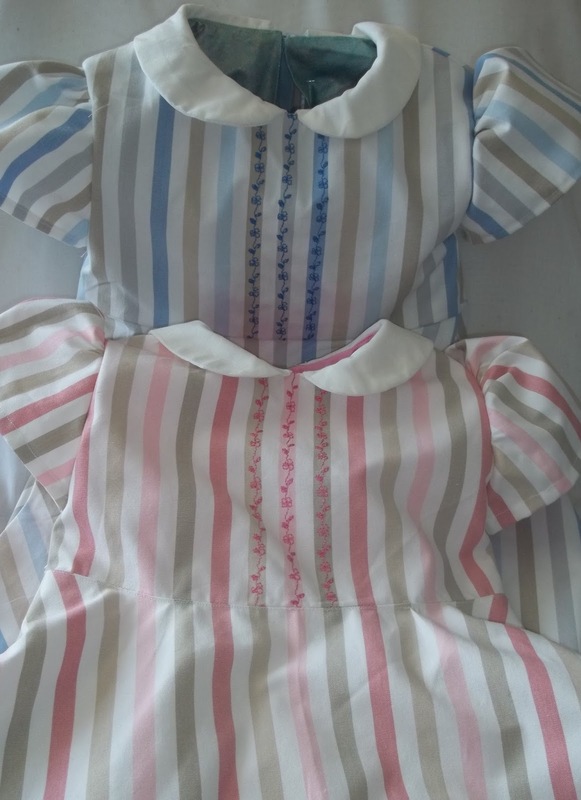 The dresses for the girls are going to done in stripes—white/grey/pink for one girl, white/grey/blue for the other....(there will be plenty left for me to make something for me, too. ) The blue stripe will be a good match for the blue vest—and the pink stripes will be a good match to the bubble gum pink solid –so some of that will be used to trim what ever I make from the blue stripes. Did I mention I have 2 other pieces of grey (besides the length of dark grey for the skirt? One piece of very light grey, (enough for for a shirtdress), and another of medium grey.. One advantage of having favorite colors, is long term, it makes it easier to make mix and match separated. But cleaning is always better when there is some creativity mixed in!